It’s strange to think that, just a few months ago, there were no foldable phones. 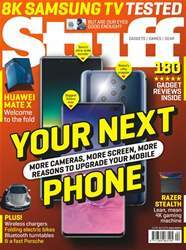 Now the chuffing things are everywhere: already there are nearly half as many foldable phones are there were members of S Club 7 at full strength. But while new technology is always exciting, the first round of devices to make use of it are traditionally a bit rubbish. And that may yet prove to be the case with Huawei’s Mate X, very much the hottest gadget of this year’s Mobile World Congress. Essentially, the Mate X is a dual-screened smartphone – edge-to-edge 6.6in on the front and 6.38in on the back – and can be folded outwards at the press of a button, turning it into a 5.4mm, 8in Android tablet. Huawei says the OLED panel – made of plastic, because glass isn’t the most flexible substance – has emerged unscathed from 100,000 folds in testing. Design-wise, then, the Mate X makes your current blower look more conservative than Jacob Rees-Mogg, and its maker isn’t holding back on the internals either. A Kirin 980, 5G chipset, Leica cameras and 4500mAh battery all contribute to the hilarious price tag. The future certainly doesn’t come cheap.